Weekend Cooking – Will You Have This Cake And Eat It? I had a nice time shopping in Utrecht (the Netherlands) with my friend M. last week. I bought some pots for preserving jam and some plant pots for in the garden. Of course, we needed our coffee at eleven and looked around for a nice place to go. Somehow, we drifted away from the main eating and drinking area (although not too far) and ended up at De Rechtbank (The Courthouse), which is attached to a 4-star hotel so it’s bound to serve quality coffee and food. To give this post a bookish angle: the book I had been reading was about food and the writer (in the part that I read just the day before) mentioned how bad the food was at De Rechtbank! But then, he was there some years ago when they had just opened. For interested Dutch readers, the book is Keukenprins by Ronald Giphart. My friend and I decided to give the place a chance and, with another bookish twist to the story, when we entered I noticed Utrecht’s most famous living poet sitting at one of the tables. Now the food. We ordered cappuccino and asked what types of cake there were to go with our coffees. We were given the choice of Swartzwalder Kirsch (a German cake with cherries and chocolate), a lemon meringue cake, apple cake, and carrot cake. Now, the interesting thing was, while the lemon meringue cake was called “citroentaart” and the apple cake “appeltaart”, i.e., by their Dutch names, the carrot cake was announced as “carrot cake”. 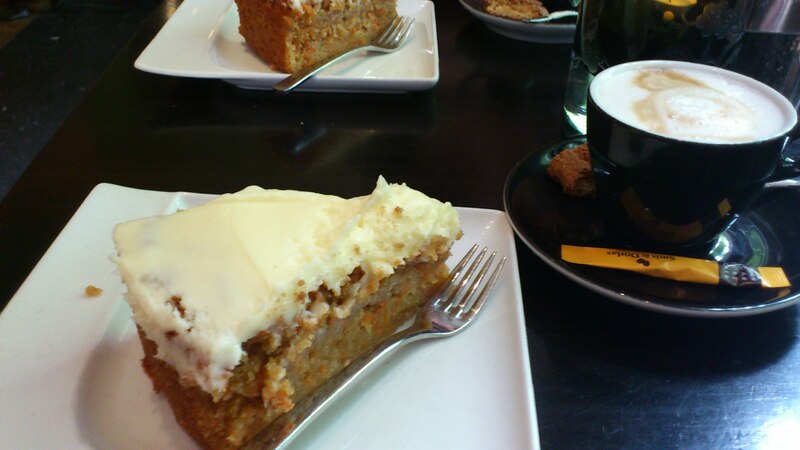 While we were eating the absolutely delicious carrot cake (generously sized and moist, a far cry from the dry stuff that you sometimes get in inferior establishments) I considered why the waiter had called it carrot cake rather than the Dutch worteltaart. The answer? We don’t eat vegetables in our cakes! Eeek! When I first lived in England (where I lived for a long time before heading back to the Netherlands) and was introduced to carrot cake, I really didn’t believe this would be nice. But it was! In fact, now it’s one of my favorite cakes. There is absolutely no taste of any carrot in this cake, but the presence of the vegetable makes the cake moist and sweet. Even if you dislike carrots, you’re likely to love this cake. In the Netherlands, calling a rose a rose by an English name, makes it less a rose. In other words, using an English word rather than a Dutch word means people have to translate the name first, and it just doesn’t sound quite as bad. Those beautiful orangy thingies that the English call carrots, in your cake? Why not? But wortels, that you use in hotpot and other dinner recipes? No way!!! So, I take it this is a trick to make Dutch people eat carrot cake. Call it by the English name and it sounds more posh and less … vegetablish! What do people in your country think about carrots in their cake? 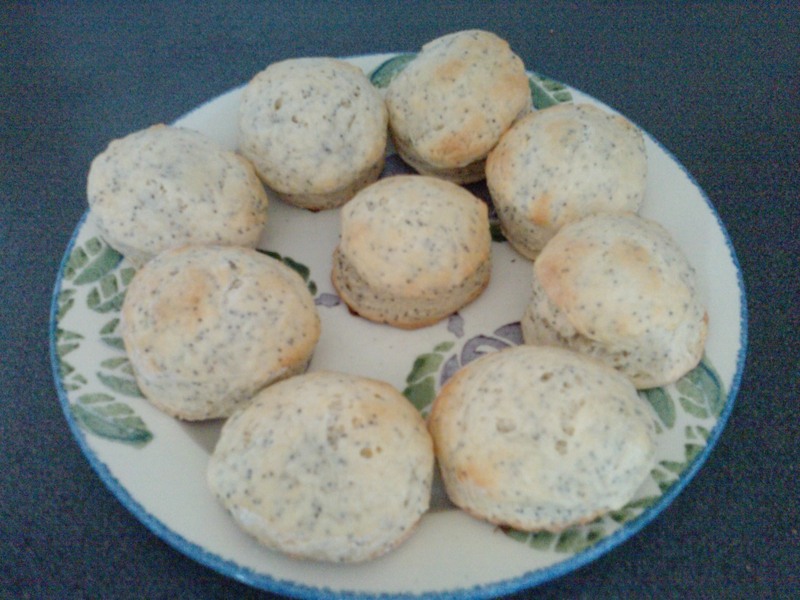 Poppy Seed Scones by gnoegnoe. Having lived in England, I love scones but I had never tried making them myself. I was already curious about them after seeing gnoegnoe use them in Bento boxes. So, when I saw the recipe last week, I knew I had to try this! Pop tarts with Rhubarb Jam by 990square. 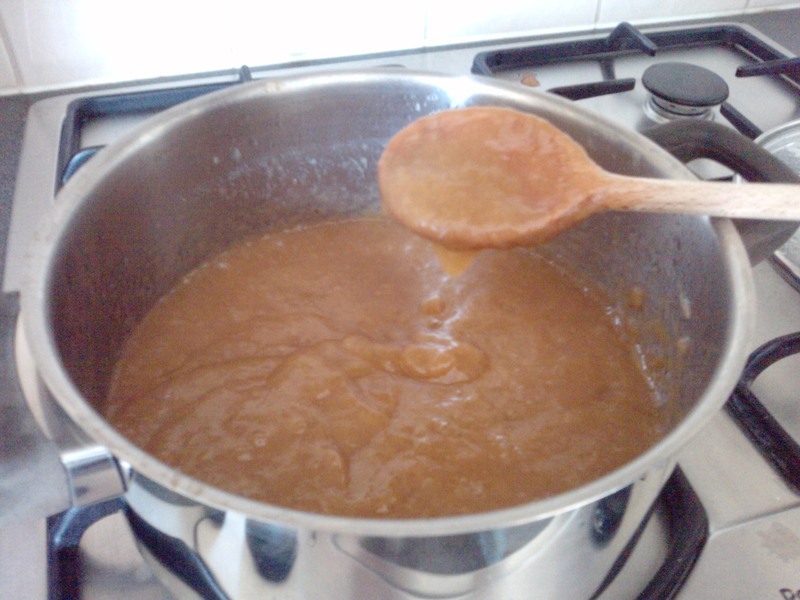 I was especially attracted to the rhubarb jam, because I’d seen rhubarb in the shops the other day and I was planning to find a recipe that uses it. You might think they look a little anemic, but that’s what scones look like, in my experience. 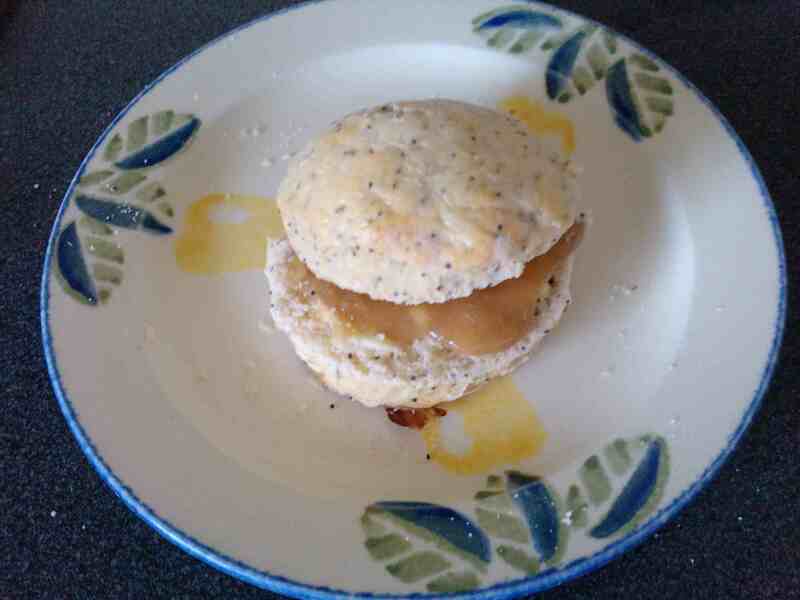 They tasted just like I expect scones to taste (but now with poppy seeds in!) and we all found them yummy. They are slightly sweet, but a savory filling would work just as well as the rhubarb jam we used. Thanks, gnoegnoe and 990square for sharing your recipes! Long did I hesitate, shall I try out a recipe for raspberry cakes that I had recently found in a magazine, or shall I prepare Minny’s cake, a chocolate cake with a secret ingredient, that features in the book The Help by Kathryn Stockett that we were going to discuss at the book group meeting (for insiders: I would of course have left out the secret ingredient for health and safety reasons)? 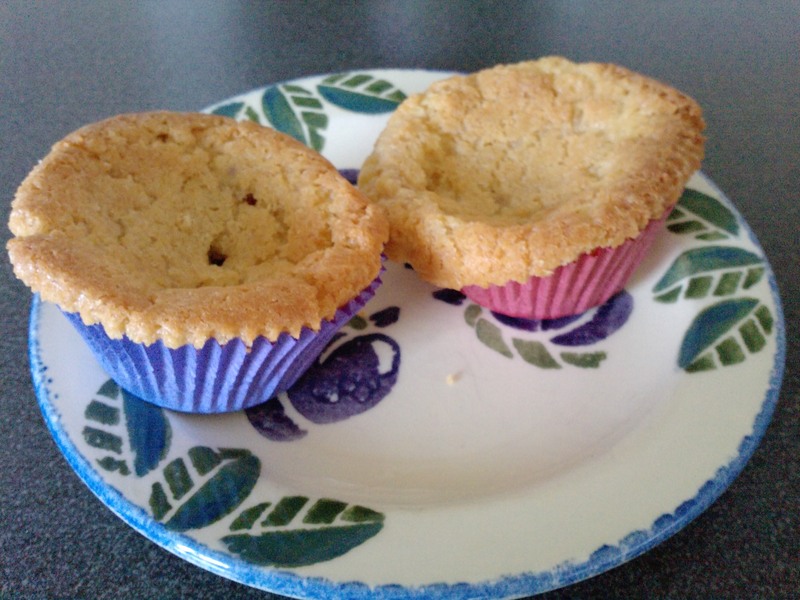 I found a recipe for Minny’s cake but it required a pie shell which was hard to get. So, I made raspberry cakes. Unfortunately they were a little high in calories, so I only had a small piece to try. Yummy was the word! So thought the samplers: husband, son1, son2 and grandma. At the book group they were eaten by some, while others preferred the also-delicious brownies made by Ingrid. The petit-fours, lovingly bought by Pauline, were also popular, and later on we had some savoury goodies. More importantly, we discussed the book. More about this later.